An early encounter with Guido Brunetti. 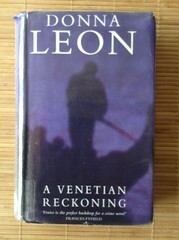 Carlo Trevisan, a leading Venetian lawyer, is found murdered on a train on its return to Venice. Things get uncomfortable at home when Brunetti learns that his teenage daughter Chiara was at school with Trevisan’s daughter, and asks her to help him find out more about the family – much to Paola’s anger.